The existing portions of the Keystone pipeline saw fourteen spills in its first year of operation, and extending it across the entire country would pose a huge public health hazard. The irascible head of News Corp sent the above Tweet on Thursday, undercutting months of diligent work on behalf of his American cable news network to paint the Keystone XL pipeline as the safest, most awesome public works project ever. 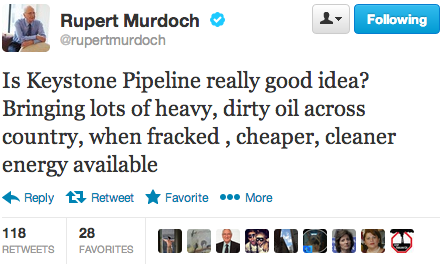 Aside from providing pipeline opponents endless “even Rupert Murdoch thinks …” talking points, Murdoch has done a real service here by highlighting a sometimes underlooked problem with Keystone XL: pipeline integrity. Indeed, tar sands oil is uniquely heavy and dirty, and the government isn’t totally sure it can be safely transported. Which is not what one really wants in a pipeline that literally traverses the entire country. Yet, the existing portions of the Keystone pipeline saw fourteen spills in the first year of operation, and there have been more since then. Dr. John Stansbury of the University of Nebraska conducted the first independent analysis of the Keystone XL pipeline and found a likelihood at the high end of the State Department estimate—1.8 spills per year, or ninety-one over the next fifty years—but strongly contested the contention that it wouldn’t be harmful to the public. If a spill happened where the pipeline crosses the Platte River, Stansbury noted, benzene—a human carcinogen—would travel unabated down the Missouri River for several hundred miles and affect the drinking water for hundreds of thousands of people in cities like Lincoln, Omaha and Nebraska City in Nebraska and St. Joseph and Kansas City in Missouri. The risks along the Keystone XL pipeline are greater because tar sands oil is much heavier than regular crude—and the government doesn’t have a handle on how to regulate its transport. Last year, Cynthia Quarterman, the administrator for the Department of Transportation’s Pipeline and Hazardous Materials Safety Administration, told Congress that her agency had not evaluated the risks of transporting tar sands oil and did not know if the safety regulations currently in place were adequate to address transportation of heavy tar sands crude. This is a crucial point, and Murdoch has done a real public service here (we’ll let that bit about fracking being cleaner slide for the moment). And it’s a very useful point for pipeline opponents to make—because while the governor of a state traversed by the pipeline may not care much about long-term global warming, he or she surely does care about massive, dangerous oil spills in the near-term. It was the initial opposition of the Nebraska governor that helped lead the administration to delay the project, and more governors should closely examine what the Keystone XL pipeline could do to their state if there is a spill. There are plenty of other reasons to oppose the project too—chiefly, the incredibly dangerous carbon emissions it would unleash, or the paltry amount of jobs it would create (only twenty once the pipeline is running, and as little as 2,650 during construction), or the fact that gas prices in the Midwest would spike. But thanks, Rupert, for reminding people of another one. Last weekend, marchers in Washington, DC, called on Barack Obama to turn down the pipeline, George Zornick reports.